Back in April 2011 the delightfully odd chaps over at London-based Kooba Radio selected The Evolution Control Committee as their Band Of The Month. Thanks guys! In a year where we'd expected a lot more action & interest for us and our new album, we gotta be grateful for those who did appreciate it. Big thanks to Kooba and especially the Jonny and Alex Show for sharing ECC with their audience! Kooba's bands-of-the-month all compete in a year-end vote to select Kooba's Band Of The Year, which means we need your vote! It's super quick, click one button, no registration or login needed, no fuss or muss. ...and just click the Vote button near the bottom of the page. Done! Voting closes December 31st. Thanks for supporting us! During last week's episode of The Sound Of Plaid TradeMark G. thought that a good future show theme might be all the songs about Johnny: Johnny B. Goode, When Johnny Comes Marching Home, Johnny Are You Queer... very complex fellow, Johnny. And then we thought we'd ask for help. And we got it: nearly one hundred replies and comments came from listeners with requests and suggestions -- wow! Johnny Got A Boom Boom, Johnny B. Rotten, The Ballad Of Johnny Cool, John E. Smoke, Johnny Behind The Deuce... that Johnny has done it all. Thanks to everyone who wrote in. We've collected most of them together and we're ready to play them for you tomorrow (2011.11.24) on The Sound Of Plaid as we honor the everyman legend of lyrics, Johnny. Many chances to hear the show, and if you can't make the times below, you can hear it at The Sound Of Plaid Archives. BONUS! 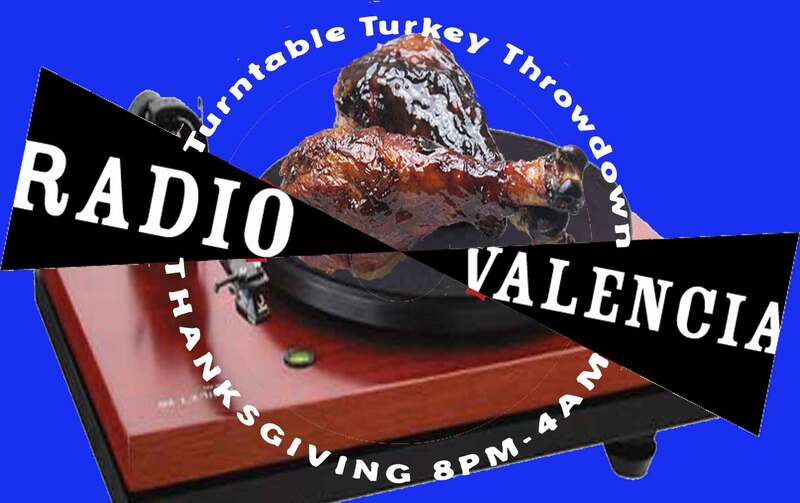 Big City Orchestra's uBradio Salon (or something like it) is joining Radio Valencia's programming, and to say thanks (it is Thanksgiving Day, after all) they'll broadcast a marathon all-nighter Turntable Turkey Throwdown. Since we're no strangers to uBradio, we'll join in for some of the fun along with guests Ferrara Brain Pan and hopefully Univac. But since we're now on east coast time, we'll only make a few of the beginning hours of the 8p-4a PST broadcast. The ECC's "Stairway To Britney" made November 2011's Top 15 list! Download that and much more from them. enjoy. As suggested during last week's Sound Of Plaid, this week we dissect The Grunt. If you don't recognize this instrumental track of The JB's (James Brown's band) by name, you'll definitely recognize its opening trumpet build and other bits throughout. Those samples figure prominently in music from Black-Eyed Peas, Eric B & Rakim, Pharcyde, Ultramagnetic MC's, Salt-n-Pepa, and many others -- in fact, Public Enemy samples it prominently on no less than three tracks on their masterwork It Takes A Nation Of Millions. This week, we explore The Grunt, it's many gruntling offspring, plus a surprise ending about The Grunt's unoriginal origins.